Swedish Egg Coffee Recipe, maybe the best coffee in the world? There are many types of coffee in the world and the Swedish egg coffee recipe is a pretty unique one. But it promises a smooth, light and bitter-free perfect cup of coffee. I swear I have not started a liquid diet! This is my third post in a row about a beverage or a drink. It’s just coincidence, or maybe the occasional warmer weather is making me thirsty. But this time I am offering you a cup of joe…with an egg! 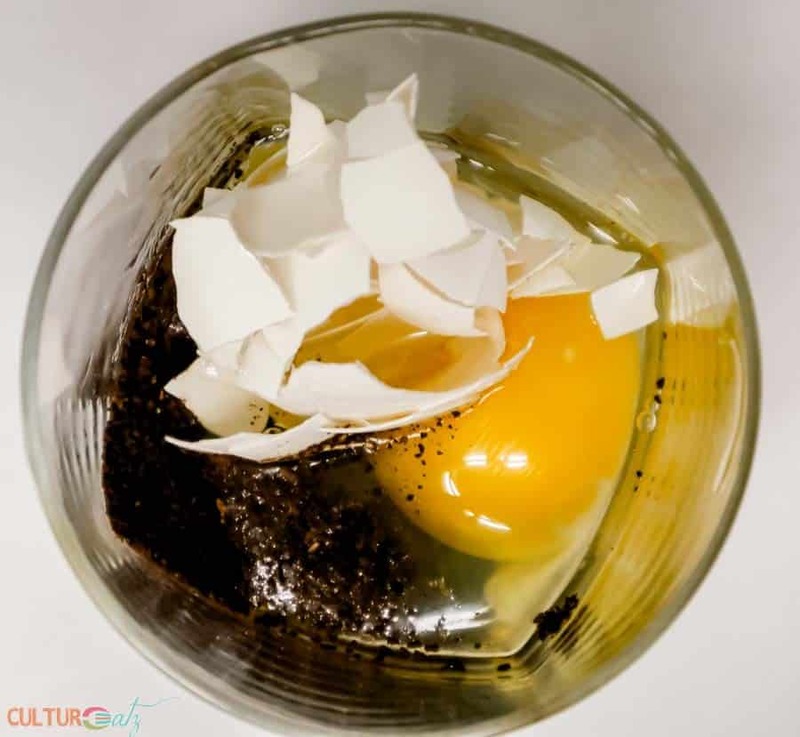 Nope, this is not breakfast but a Swedish egg coffee recipe for this month’s Eat the World recipe challenge as we visit Sweden! Back by popular request, I’ll talk a little bit about the country like I used to. Sweden is the largest of the Nordic countries and has a population of about 10 million, 2 million of them live in the capital of Stockholm. Bordering Sweden, you will find Norway, Finland and is connected to Denmark via the bridge of Öresund. The Baltic Sea lies to the east of Sweden, as well as the Gulf of Bothnia. After Switzerland, Sweden is the next in line to be known for being a country of peace. The standard of living and life expectancy rank among the highest in the world. Sweden was another country I was sure I had not cooked from yet on the blog since I had not named the country itself in the post. Well turns out I had already made a couple of Swedish food recipes or some that are also very popular there. I long time ago I made some homemade gravlax and turns out blood pudding is also very much enjoyed there. But no Swedish drinks yet, till today. This Swedish coffee would be a great match to some Swedish dishes, or perhaps their famous Swedish cinnamon buns, or after your Ikea meatballs with Lingonberry jam. Swedish dishes also include lots of seafood, meats, dairy, a big variety of bread, berries, and fruit soups. Swedes love their beer, vodka, and Akvavit liquor. Again, skål! 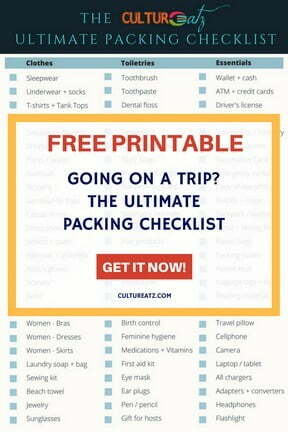 Did you get your FREE PRINTABLE yet? Surprise! 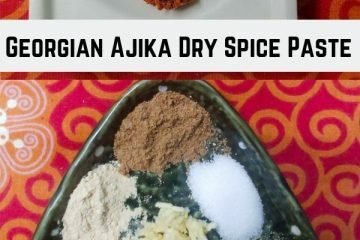 I have prepared a Cheat Sheet that includes 41 Cooking and Baking Ingredient Substitutions that are commonly found in a kitchen. 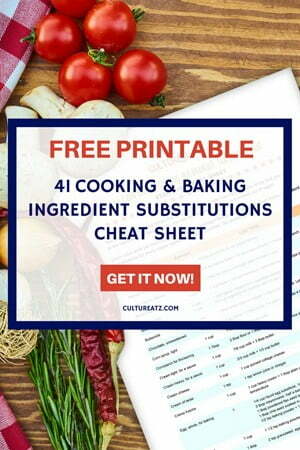 Click here to get your FREE Ingredient Substitutions Cheat Sheet right now! Eggshells contain calcium carbonate, which helps to neutralize the acid extracted from the coffee. There are also several enzymes in the egg which neutralizes the bitterness often found in coffee. You get a super smooth and mellow cups of coffee. So smooth you may want to skip the milk or cream. The recipe multiplies easily (see recipe). Make one cup of coffee or scale up for a group with ease. My recipe is for 1 cup but you can easily multiply it as indicated in the recipe. To be scientific, the amount of coffee grounds per cup is a 1:16 coffee to water ratio. One portion uses 2 cups which is 16 ounces. So you need 1 ounce of coffee which is roughly 2 tablespoons. It’s pretty easy this way to figure out how much coffee per cup you need. This ratio works for all coffee brewing methods. Why do you need icy cold water? 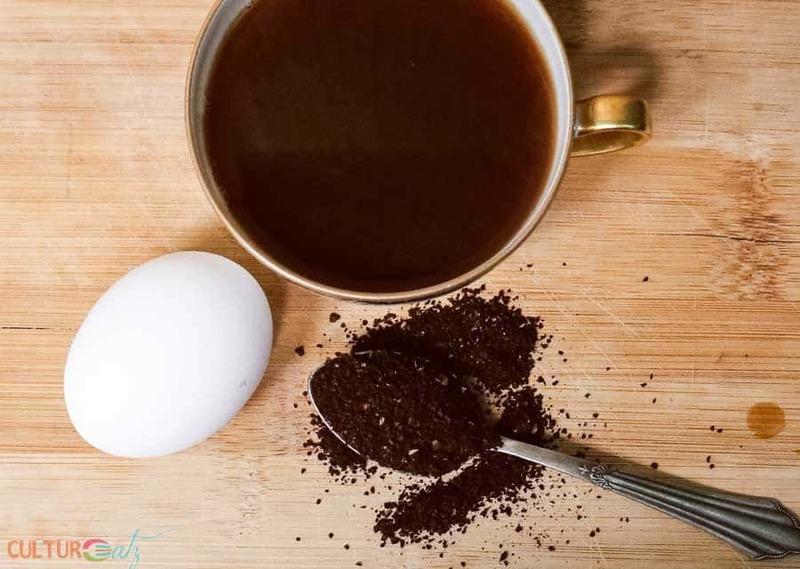 When you add the water to the coffee, it will cause the egg and coffee grounds to clump and sink to the bottom of the pot. But the water has to be really cold for it to work so I placed a glass of cold water in the freezer a good 10 minutes before. 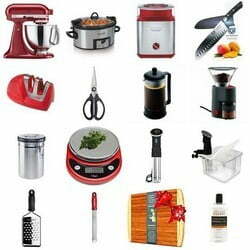 Yeah, there are really many different ways to make coffee! Now let’s talk about why you may skip the creamer and may consider this to truly be one of the best ways to make coffee at home. My theory of why this is the best coffee recipe is that the egg yolk is responsible for the creamy taste to an already smooth, mellow and acid-free cup of coffee. 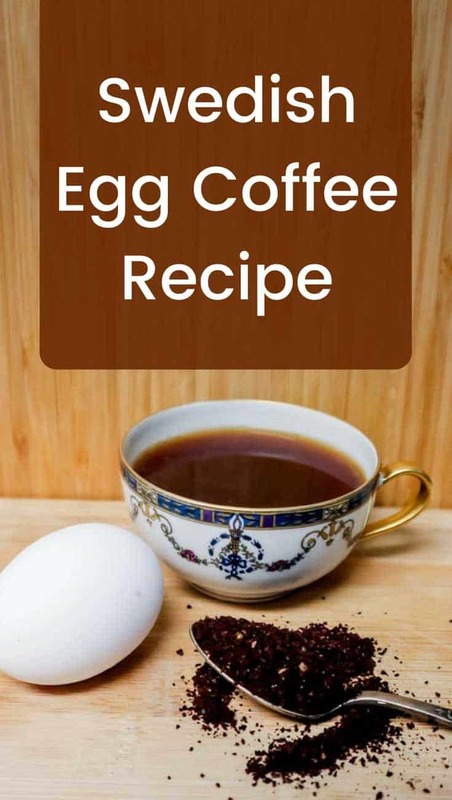 I really enjoyed this egg coffee recipe. I do like a stronger coffee normally but the lack of bitterness and acidity made up for it. And I normally only add a touch of milk so I found it maybe even a bit too creamy for my taste. Nonetheless, I was really impressed and happy I tried this cooky way of preparing coffee. And according to the Swedes, this may be the best coffee in the world! So I would love to know how do you brew coffee at home? And do you think that this Swedish egg coffee recipe is the best coffee cup to sip? In your opinion, what is the best coffee? How many ways do you know how to brew coffee? Bring to a boil the water in a small pot. In the meantime, crack the egg into a glass with the broken up eggshell. Add the ground coffee, 2 tbsp cold water and beat lightly. Lower heat to med-low and add the mixture to the pot. Simmer for 2 minutes. Remove from heat, cover and let it rest for 8 minutes. Add the cup of ice cold water. The solids will clump and sink to the bottom of the pot. For this to happen the water has to be really cold, keep it in the freezer for a bit before. Strain it through a fine mesh strainer or a French press and serve. Looking for more fun and unusual coffees? 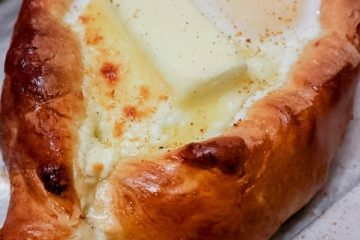 Check out all the wonderful Swedish dishes prepared by fellow Eat the World members and share with #eattheworld. Click here to find out how to join and have fun exploring a country a month in the kitchen with us! 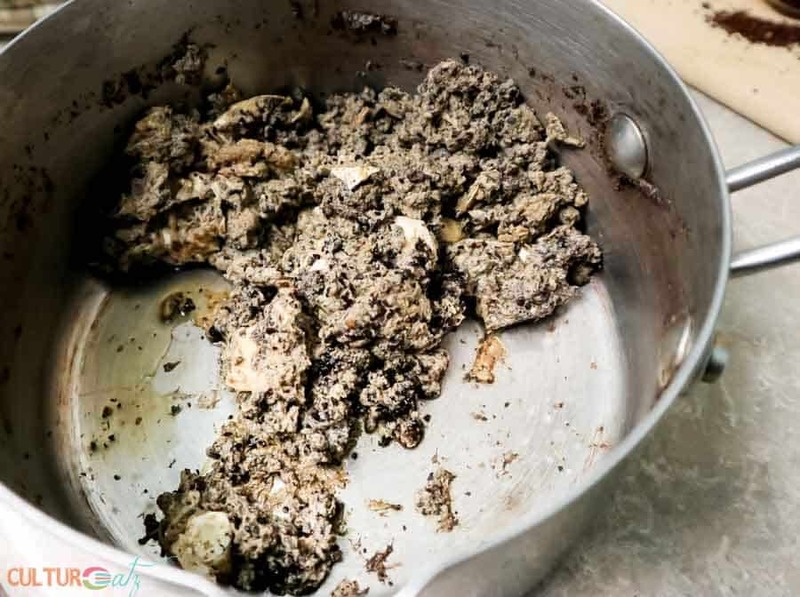 Did you make one of my recipes? I would love to see it. Take a photo and tag me on Instagram @cultureatz. EDITOR’S NOTE: This post may contain affiliate links (disclosure policy). 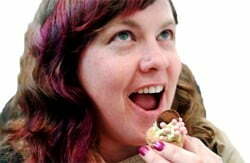 Please support CulturEatz by clicking on the links and purchasing through them so I can keep the kitchen well stocked. It does not alter the price you pay. I grew up hearing about egg coffee coming from a Swedish family. It wasn’t until I went to the MN state fair did I actually get to drink it. I look forward to getting it every year. (Sadly, those who knew how to make it are no longer here to teach me.) But thanks to you, I now know how to make it at home!!! I am so glad you know of this coffee already, not many do (even Swedes). So glad you will be able to make it again! I suggest a bigger batch of the egg absorbs all the coffee grinds. Thanks, Lorraine, if you try it I recommend upping the recipe to 2-3 portions if you try it or the coffee grounds just solidify in the egg a lot. Love coffee! Drinking some right now. Made in our French press. I know about putting eggshells in coffee ("cowboy" coffee -- when you boil the coffee grounds with water). But the whole egg? Interesting! Really fun post -- thanks. I never heard of the egg shells but read it a lot when researching as a thing done when camping, like cowboys lol. Enjoy your cup of Joe! So, you know me and my different ways of brewing coffee, which are pretty common: drip by a coffee maker, French press and espresso maker. My mother used to use the pour through method before she got a coffee maker. My absolute favorite is the Costa Rican poas medium roast. My questions are, is the Swedish egg coffee served cold and what happens to the egg and egg shell? OMG I TOTALLY WANNA GIVE THIS A GO! It sounds so intriguing to me... And I mean, I always need a little more PEP in my step!!!!! You can replace milk in your coffee with egg yolks!!!!!!! perfect for you lol. Thank god it is mellow, you can make 3 cups worth and NOT BOUNCE OFF THE NEW WALLS! I haven't tried Swedish Egg coffee but i'm really intrigued how it would taste. That's truely an unique way of making coffee! Loved reading about it as well as the Swedish cuisine. I just recently tried Vietnamese Egg Coffee, so I was curious if it was a similar process. It's not! I might enjoy this. I'll give it a shot. Yum! I have tried Vietnamese egg coffee, but not Swedish yet. I love how it incorporates the shell. Your post *almost* makes me want to give egg coffee another chance - I had a very different experience with this stuff when I tried it! Haha! Thanks for hosting! Oh really, what happened on your try Amy? I find the bigger the quantity you make, the better. So interesting and a lot of work for me in the morning when I am wanting my cup of coffee the minute I open my Weyes LOL.....Perhaps an after dinner coffee though. It was not that bad, maybe after lunch...unless coffee does not keep you awake at night lol. Hi Evelyne, once again it has been such a wonderful time being part of Eat the World, and this months stop in Sweden. I was really curious when I saw your Swedish Egg Coffee. I grew up eating raw eggs whipped with sugar and a marsala wine every morning. I can only imagine as I have never had this coffee that it would be rich and smooth. Nicoletta and I brew many different ways and love our coffees. We use a French press. or an old fashioned espresso maker, our tried and true drip coffee and also a pour over. We have a local coffee roaster in Edmonton called Ace and their coffees are amazingly bold and really smooth cup of Joe. Can't wait to see where we are traveling next skål! It's a joy having you both every month Loreto! What you described is like a sabayon? So good! I am curious to try the Chemex brewing gadget everyone talks about. Wow, I have never seen coffee made that way. I really want to know who first tried it, who woke up and was curious enough to test out egg shell in their coffee? LOL Juli that is an EGGcellent question! Very interesting, but I think I stay with tea :-)) Coffee with egg and shell....you are darn adventurous! LOL Angie, yep I do crazy kitchen stuff sometimes!